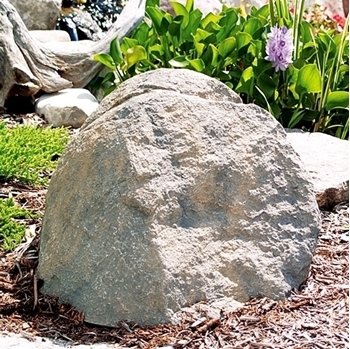 Pond Logic TrueRock Small Boulder Covers are the most realistic faux rocks on the market and make a great addition to any pond landscape. With its weather-proof textured finish and rock-hard construction the TrueRock is not only a viable decor item, but a protective cover as well. Texture molded and colored to look exactly like real rocks and stones, the Pond Logic TrueRock will blend right in to your pond landscape, even when placed amongst real stones! The beauty and durability of the Pond Logic TrueRock make it not only a great protective cover but an attractive landscaping tool as well. Protect unsightly yard blemishes and valuable pond equipment with the Pond Logic TruRock. Constructed from rugged fiberglass materials, TruRock Faux Rock Covers not only look like a rock â€“ they are as strong as one too! The Pond Logic TrueRock is great for covering aeration pumps, skimmers, waterfall boxes, tree stumps or anything else you want to hide from view.